Google is back in the hot seat today following a CNET report that suggests the search giant's Street View cars collected the locations of countless Wi-Fi devices. Along with mapping Wi-Fi access points (the intended purpose), the vehicles also charted the street addresses and unique identifiers of wireless Internet devices such as laptops and smartphones -- a practice that has been confirmed by the CNIL (France's data privacy commission). What's worse, the search giant reportedly releases that information online, and you can't opt out of it. Harvested MAC addresses and their last known coordinates are published on the company's public geolocation database for all to access. Although this isn't inherently dangerous (it's effectively just a snapshot of where your device last was, so it's not like someone can stalk you with the information), it still raises valid privacy concerns. For instance, someone could use the data to show you were at a specific place during a specific time, and that's something you might not want to share with the world. The Internet exploded earlier this year when it was discovered that Apple's iOS devices recorded a year's worth of location data that could be mapped to show your previous whereabouts. The company later released a software update that minimized users' biggest complaints. 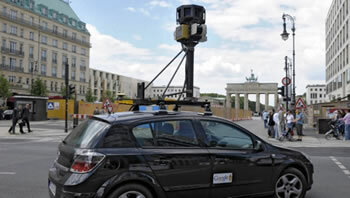 And of course, isn't the first time Google's Street View cars have been caught gathering more information than intended. The company faced worldwide investigations, raids and even a $143,000 fine from France after it was discovered that the company "accidentally" collected private information from Wi-Fi networks, including emails, fragments of visited websites and passwords. The US FTC dropped its Wi-Fi sniffing investigation last October. Google has remained incredibly quiet about the latest controversy, declining CNET's requests for comment. The site asked Google more than a dozen questions on the subect over the span of several months and the search company hasn't answered many, if any of them. "It would be helpful to have some clarity about why and how (a hardware address) got in there so people can act accordingly," said security researcher Ashkan Soltani.